Staying on top of your credit score means being proactive. One of the ways you can help it rise is by removing accounts that are closed from your credit report. Closing an account does not mean that it will no longer be on your record. One common question in this area comes from student debt. 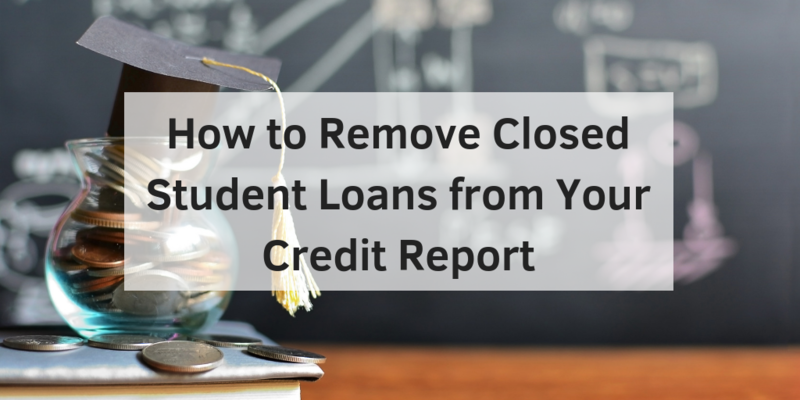 How exactly can you remove closed student loans from your report? Before you make any decisions, you need to know the factors that make up your credit score. Your available credit, the age of your credit accounts, and your payment history, for example, are all part of your score. How often you apply for new credit cards and the number of closed accounts present can also impact your score. Closed accounts hurt you even if they were paid off in full. Any late or missed payments or charge-offs can still be seen and affect your overall score. Don’t remove things indiscriminately. Removing a closed account with negative information on it makes perfect sense, of course. But removing an account with a mostly positive history would not be beneficial and could ultimately hurt your credit score. Scrutinize your credit report for closed accounts and determine whether they’re good or bad for your score. For student loans, it is common to see missed payments early on before the students in question find stable careers. Writing a goodwill letter applies when you couldn’t pay due to illness or something else beyond your control. Keep in mind that the creditor or loan service provider has no duty to remove the closed account. If they do so, they will be doing it in good faith and will likely look at your previous payment history. Disputing accuracies is another option. It requires careful examination of your loans. You will have to justify each missed payment and give your reasons for believing you have been wronged. Finally, waiting the process out is another solution. Some closed accounts can remain on your report for up to ten years, however, is it’s not the best choice. Credit repair companies can be the ally you desperately need in the battle for stellar credit. They specialize in these types of cases and understand the oppressive laws and regulations behind student loans. Allowing a credit repair company to go to bat for you can take a lot of stress off your back, too. They will typically provide you with all the education you need to clean things up and maintain a great score. Finally, bad credit has an effect on student loans and interest rates. And, of course, student loans impact your credit in much the same way. This is a vital part of your report that cannot go ignored. For more information about how to remove closed student loans from your credit report, contact Go Clean Credit to get back on the right track. We have many credit repair programs that are available to help you overcome your credit situation and place you back on the path to financial success. Real credit restoration is not a one size fits all model and we tailor your needs to the right program, but most people can start for just $99 per month. We have fixed price programs that get you back on track in as little as 5 months, debt resolution solutions, programs geared toward people who have had recent short sales or foreclosures and many others. Help is just a free phone call away or you can fill out an appointment request. Contact Go Clean Credit to schedule a free consultation today!